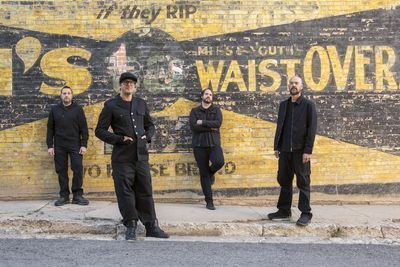 The lead singer talks about his new memoir, piloting his band's Ed Force One jumbo jet and creating epic metal that "rivals Cecil B. DeMille." He’s an airline pilot, a world-class fencer, an actor, a novelist and a craft brewer. 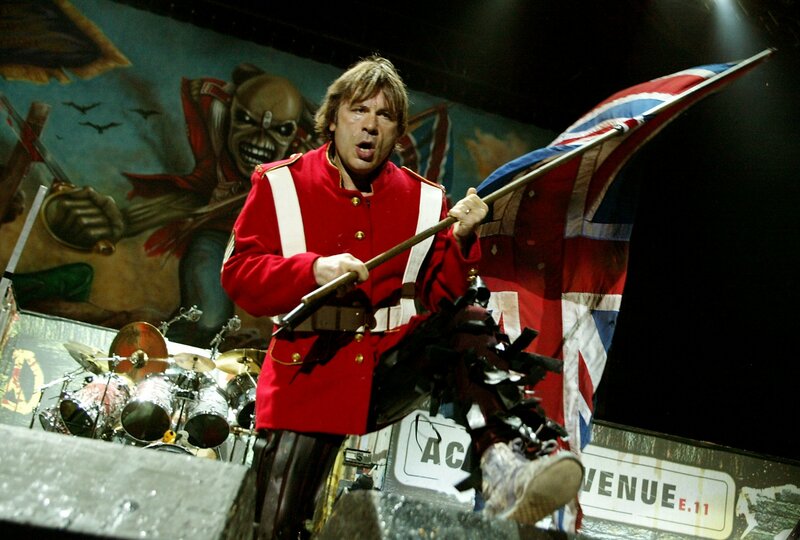 Most people know Bruce Dickinson, though, as the lead singer of Iron Maiden, the heavy metal band behind such hits as “The Number of the Beast” and “Die With Your Boots On,” with 90 million records sold. Occasionally, his interests overlap. 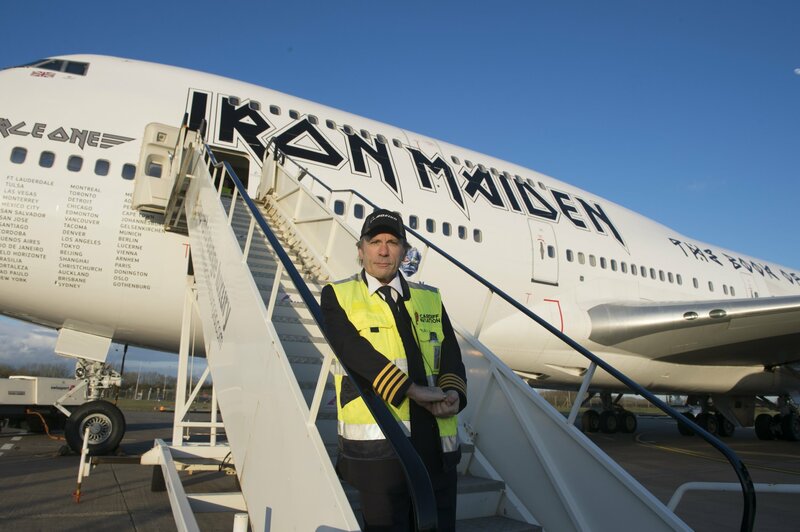 Dickinson piloted Maiden’s Ed Force One, the 757 named after the band’s skeletal mascot, Eddie the Head, during several Maiden tours (for its 2016 tour, the band upgraded to a 747). 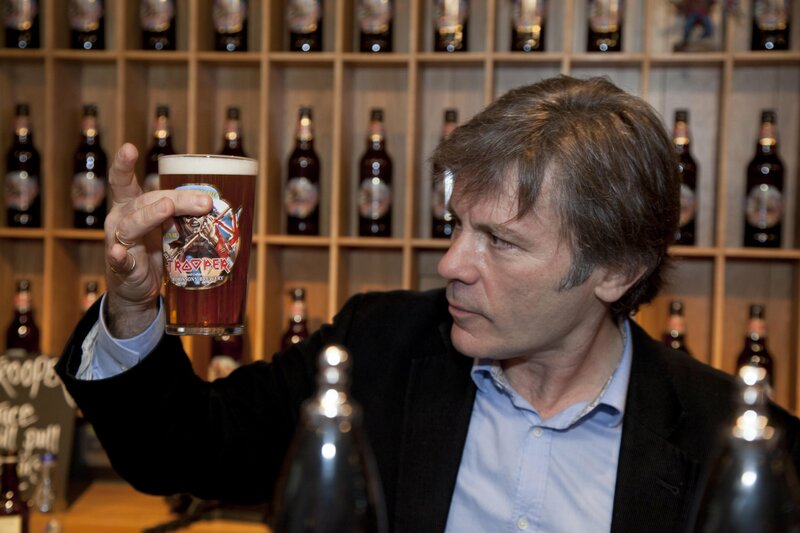 And he’s had a key role in the Iron Maiden/Robinsons Brewery line of Trooper beers, named after another Maiden tune. Dickinson tells all in a new memoir, What Does This Button Do?, which, in addition to band anecdotes, details his battle with oral cancer. Recently, the headbanging renaissance man did a conference with Bob Geldof and Kofi Annan in Bogotá, Colombia, about green technology. 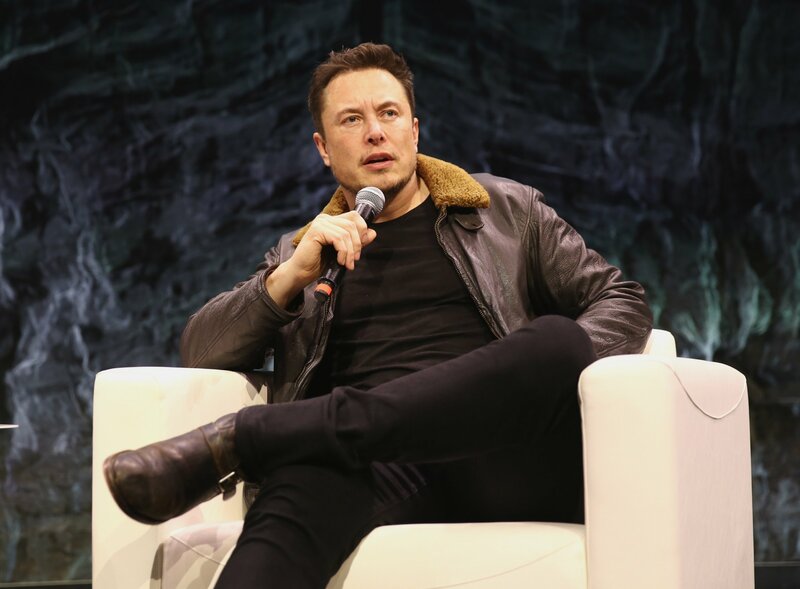 Dickinson discussed a couple of projects there—a hybrid airship he has invested in and something called a Pouncer. “It’s a 9-foot-wingspan edible drone. You can eat it,” he tells Newsweek, before diving into Maiden lore. Your shows are famous for their Spinal Tap-esque sets. 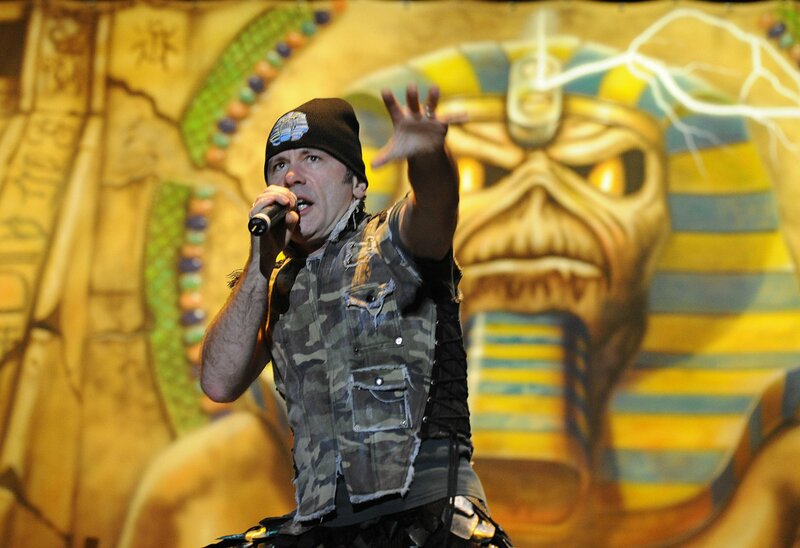 The 1984 Powerslave tour may have been the pinnacle in that regard. It’s a fine line between something being incredibly kitsch and magnificent, and Powerslave [the album’s tour] just clicked every box. There’s not too many bands that tell you, “We’re gonna re-create ancient Egypt onstage.” We had a giant 10-foot Eddie walking around and a huge one with rockets shooting out of his eyes. It was epic, kind of like Cecil B. DeMille. And because it was back in the day, it was all theatrical-sized props. It wasn’t screens. It wasn’t hologram. It was real. You write about performing in Wroclaw, Poland during that tour. While there you visited the former Nazi concentration camp, Auschwitz. In What DoesThis Button Do? 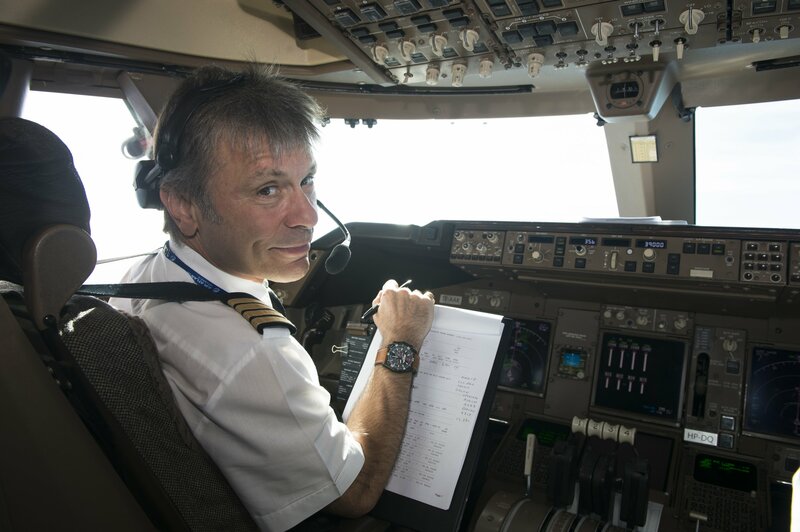 you write about captaining Iron Maiden’s charter airliner while on tour. The length of the book is just under 400 pages, but during the editing process, we cut out about 60,000 words, and about 40,000 of those were about aviation. I could have written half the book for plane geeks and gone into a lot more detail. Maybe there’s an aviation-geek book somewhere in my future…. I tried to strike some kind of balance between the entertaining aspect of it and trying to make people understand what the feeling was like, as opposed to getting overly technical about things. I think that when people read a book, they want to experience a book. 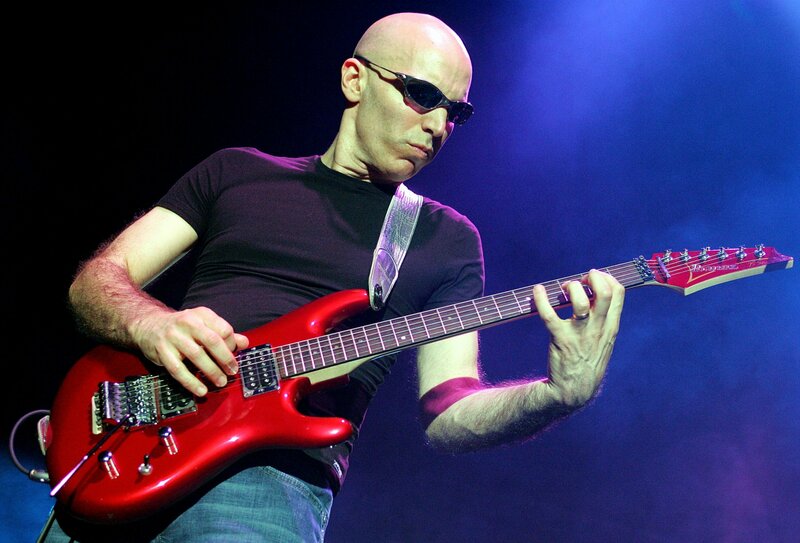 You also write about playing in your first band, named Styx, like the American supergroup. Believe it or not, I actually got a tax demand for some huge amount of money, and my parents freaked out. “What's this?” The American Styx must have played a concert somewhere. But after we played a gig in a little pub in Sheffield, I was sent that tax bill. 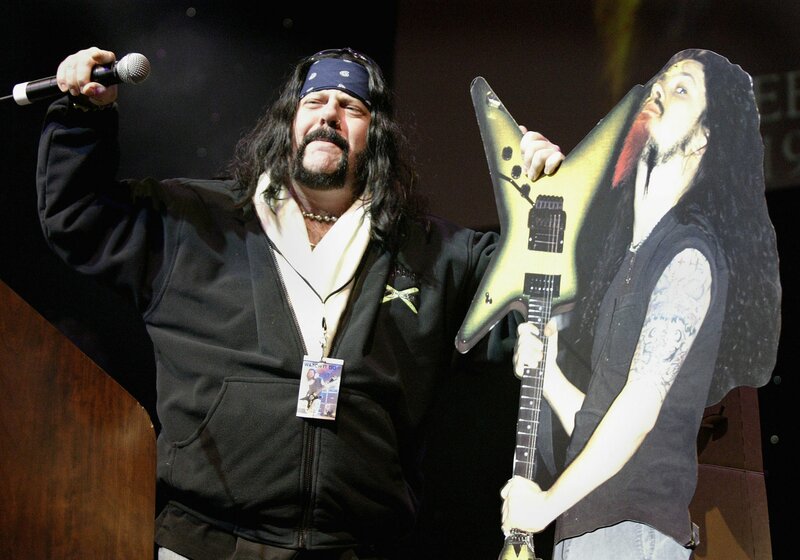 Back when you were known as Bruce Bruce, you played in a band called Samson, which was involved in something called the Heavy Metal Crusade. This was during the New Wave of British Heavy Metal, which is the most unpronounceable movement ever known to man. A lot of things about that whole period were awkward—it was a strange period of transition. People were disillusioned with society. 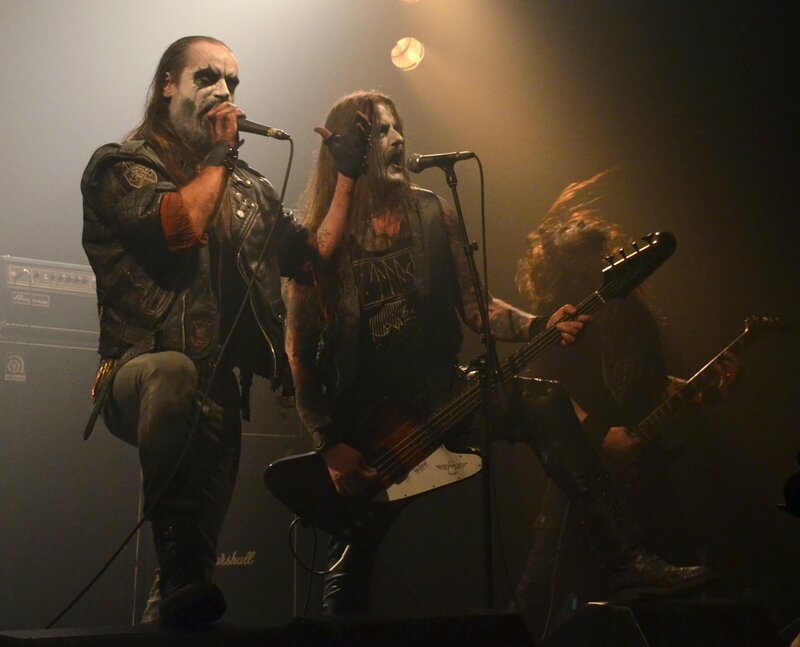 Some did the punk thing, others did metal. But lots of people were angry. And some didn’t know why they were angry, but thought they ought to be angry. It all kind of faded into the ’80s, when everybody stopped being angry and just got drunk. 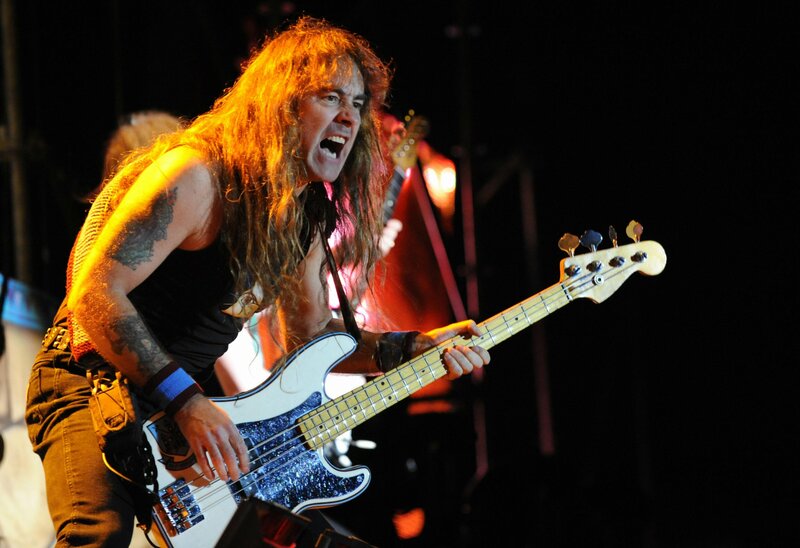 Before you joined Iron Maiden, you saw them perform “Prowler” and got goosebumps. It reminded you of the time you heard Deep Purple. What was it like joining Maiden? It was like having pitched in Little League and somebody saying, “You’re pitching for the Mets next week.” [Laughs.] That’s exactly what it was like, and you have to pinch yourself, but you’re so fired up, you don’t even think about it. You’re unstoppable; you think you could walk through a wall and wouldn’t feel it. You talk some about Iron Maiden influences, including Purple, Black Sabbath and Jethro Tull. Yeah, absolutely. Particularly for me and [Maiden songwriter and bassist] Steve Harris, it was all the early Tull stuff, and I quite liked the folky stuff. Steve was more into intricate material. Steve is also big fan of Yes, and a lot of his bass sound comes from that Chris Squire-like twang. There’s also a few German bands he likes, including the prog-rock group Nectar. There’s an awful lot of that going on in Steve’s background, which was not really what was going on with ’80s American hair bands. That's why Maiden were completely different, even though people tried to portray us as part of [the hair-metal movement]. You can’t really assimilate Maiden into a movement. We’re a completely stand-alone unit. And that’s the reason we survived. You came up with the phrase "theater of the mind." What does that mean exactly? It's because Maiden’s music runs the gamut of all the emotions. You close your eyes and on a track like “Aces High,” you’re there, you’re sittin’ in the cockpit, guns blazing. “Revelations” is like being in a church. So when I was involved in writing songs, and even when I wasn’t involved, I would think, I have to see the movie in my head, of what I’m singing about, you know? And I genuinely believe that that communicates itself to an audience. They see what they want to see. I don’t know what’s going on in their heads, but we must be doing something right because they’re coming back. You fence at a world-class level, and you've displayed some of your moves onstage. Who was your mentor? My main mentor was a very colorful Hungarian fencing coach, who sounded like Bela Lugosi. I do all these weird little dance steps, but they’re really not dance steps, on stage. I think it might be on the Live After Death [album] or something; there’s an absolutely splendid full-on fencing lunge. And then there's beer. You and Robinsons Brewery established the Trooper line, named after the classic Iron Maiden song “The Trooper.” How’s the biz going? That’s a real poisoned chalice, that one. [Laughs.] I love beer. I love drinking it. I’m not a fan of the real generic mass- produced beers; I like real ales. Obviously, all beers to an extent are mass-produced. But the really big breweries seem to make beers that are soulless and bland. We got the opportunity to play around, and I started approaching creating beers like creating songs. I work with Robinsons's master brewer, Martin Weeks. I come up with the songwriting ideas for the beer, or “taste-writing,” and he's like the producer, taking ot into the studio and coming up with a finished thing. Then I go, “Whoa, that works” or “Maybe we need to tweak it a little bit.” Robinsons thinks our latest beer, Hallowed, is the best they've ever brewed. And lest you forget who is behind the beer, the label includes the band’s mascot, Eddie the Head. We’ve rebranded the bottles so the Iron Maiden connection is less and less, because the less we’re about Iron Maiden, the more we sell. [Laughs] The beer sells itself on its own merits—more than 18 million pints of Trooper have been sold. We've got four beers now: Super Original, Trooper 666, Hallowed and an imperial stout, Red and Black. I’m really proud of the stable I’m creating. We’ve got this game, Legacy of the Beast, as well as the first five installments of a comic book series, and I’m blown away by the comic. And I have to say, I’ve got nothing to do with it, though I’d like to because I think it’s so good. [Laughs.] I think it’s an interesting direction for us because of that whole “theater of the mind” idea. Well, now you can be inside it. Publish and be damned! That’s not a bad line, is it?